We descend into the foetid jungles of Evolve, in pursuit of terrifyingly alien creatures, driven by the thrill of the hunt. How far will the allure of the big hunt take us? Just how thrilling does it get? And perhaps most importantly, how long do jetpacks take to refill? That’s the problem with hunting I suspect, much like fishing, it is a whole of waiting. So Evolve has that aspect of hunting down to a tee, most matches I played consist largely of running from point to point and accomplishing very little, the only real tracking you do is for the next gaudy red HUD element. When at your most observant, you might spot a shadowy monster weaving between, or simply through, distant trees. It is a powerful, authentic thrill, which lingers until you find yourself doggedly following another trail of blue flashing footprints. 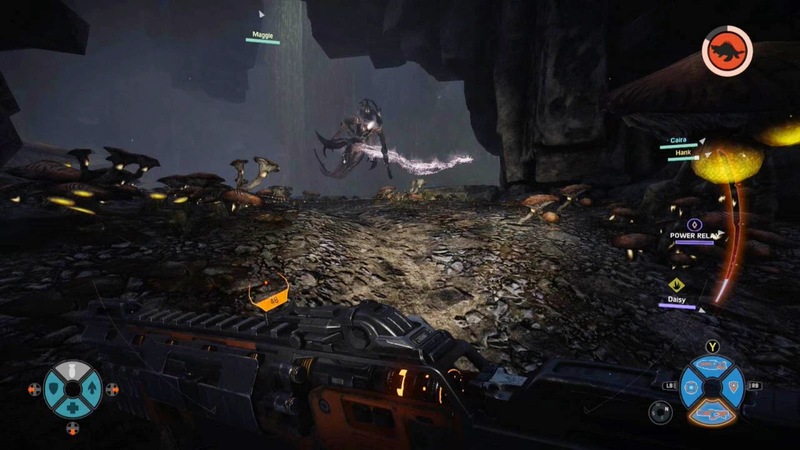 Evolve is an asymmetric multiplayer first-person shooter, for the most part. You either play as a hunter on a team of four, which plays like a first-person shooter, or you can attempt to harness the power of a solo monster, from the third-person perspective. Though you can technically play offline, the solo game modes are simply the multiplayer modes only with bots, who ironically often displayed more tactical prowess than many of my randomly matched human companions. The solo modes are soulless, but I did use them as a test bed for freshly unlocked characters, rather than going in blind online. There are sixteen maps, all look nice enough, but lack in visually diversity. There is a heavy emphasis on vertically, which aside from making them more interesting to traverse, allows both sides to ambush, evade and trap each other. There are four different hunter classes, and three characters in each class, each with their own unique twists. For example the medic class, the class I opted to play the most (you can select your preferred class, but the team must contain one of each) consists of; Val, a sniper armed with heal beam and tranquilliser guns. Lazarus, also a sniper, wielding a silenced rifle to help make the most of his personal stealth cloak ability, he also uses the ‘Lazarus device’ to heal bled out and otherwise un-revivable teammates. And finally, Caira, who packs grenade launchers, of both, the napalm and healing variety, as well as a speed boost buff to herself and nearby hunters. You begin with only Val unlocked (unless you preordered a version with promotional unlock codes), you must level up her abilities to unlock Lazarus, and so on, all the class are the same. All of the medics can use a heal burst ability, which is an area-of-effect heal, but they all play quite differently; Val and Caira try to keep the hunters alive, while Lazarus revives dead allies. 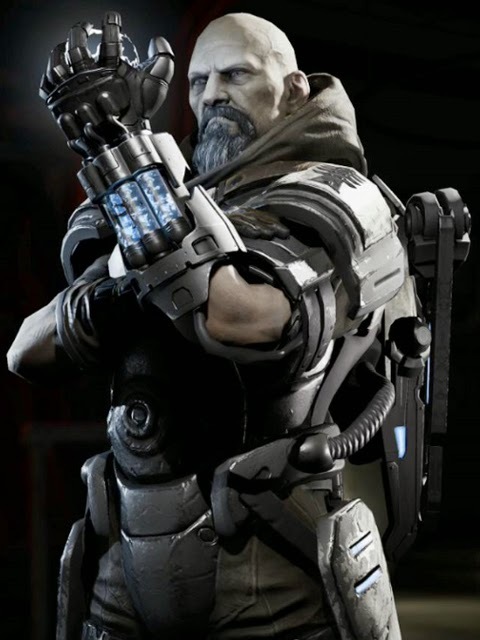 While Val and Lazarus are both snipers, Lazarus supports a more lone-wolf approach, with the stealth cloak allowing him to escape and evade the monster. Both sniper rifles paint weak spots on the enemy, which when targeted by teammates, flashes red and deals significant damage. My approach was to always gain height and keep well out of arms reach of my prey, circling the target, reviving when necessary, all the while painting the monster with weak points. Frustratingly, most of the random hunter companions I played with, either didn’t know to exploit the weak points, or perhaps just weren’t sufficiently accurate. My efforts wasted, it is certainly part why I feel this game only works with a team containing at least some friends with headsets. All of the classes have their own significant role in the hunting party; the support uses defensive, offensive, and stealth buffs, depending upon the character chosen. Trapper, as you might expect, traps the monster, but is also often responsible for leading the party. Assault is the least nuanced class, they deal, and to a lesser extent take damage. All the classes are vital to the success of the hunt. However, while they are the hunters, the advantage can seesaw on a dime, the monster is outnumbered, but not outmatched; a mediocre monster player can easily tear apart a disorderly team of hunters. The monsters are – and rightfully so – the stars of Evolve. There are only three, and just like the hunters, they must be unlocked in sequence. The monsters all look great, their movements ooze predatory intent, and they wouldn’t look out of place amongst a horde of Warhammer 40K Tyranids. 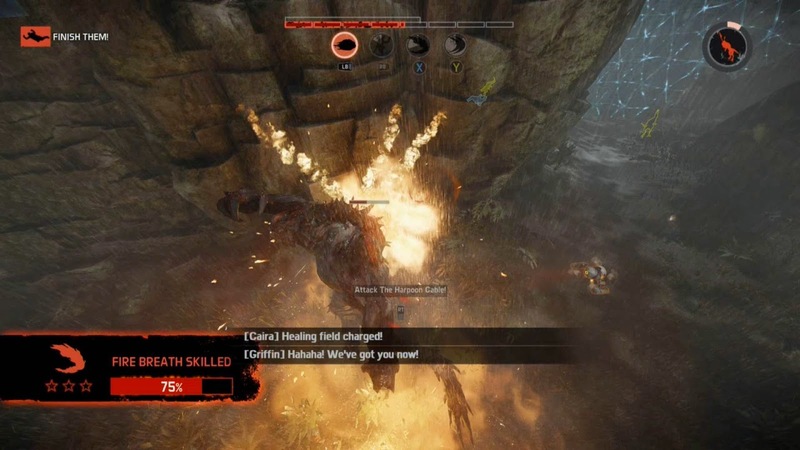 Initially you wrangle control of the Goliath, a fire breathing behemoth, whose strength wavers in the presence of the flying Wraith, which has been dominating the hunters even since the beta. Both the Wraith and the Kraken can fly, ensuring both are usually significantly harder to engage, but the Wraith can literally teleport, is substantially faster, and of course, tough. I don’t believe I have ever been in a party that triumphed against the Wraith yet; one could argue I am simply bad at the game, so too are my friends and all the random hunters. Maybe we needed a new strategy, or maybe it is just overpowered? Regardless, Wraith matches quickly became bitter experience. 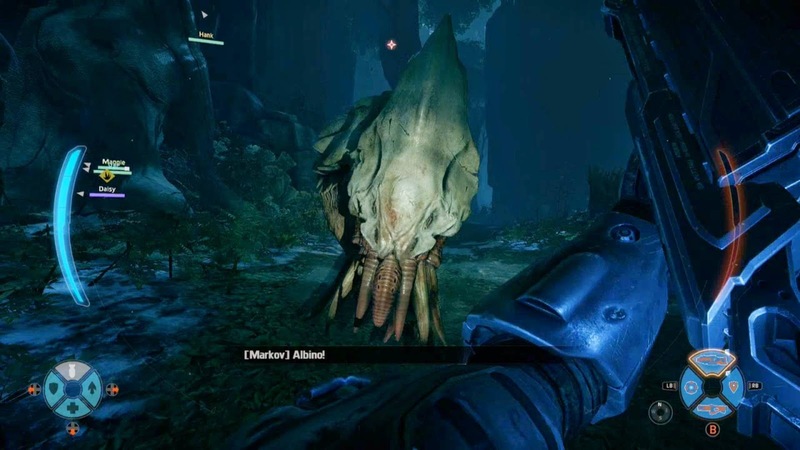 My time with the monsters is easily the best time I had alone in Evolve (you cannot play as a monster while matchmaking in a party), although you are strong, you can be easily trapped and overpowered by a synergistic team of hunters. As the monster you must stalk and feed on the rich variety of wildlife, but some puts up more of a fight than others, the planet Shear has predators of its own. By feeding you gain armour (you cannot regenerate health) and eventually you can evolve. With each evolution you assign points to improve your preferred abilities, you can evolve twice per match. While evolving you are vulnerable to attack and you lose any armour you had. The tension of hunting while you yourself are being hunted, is what makes the monsters so interesting to play. Unless the hunters are disorganised and separated, I never attack before reaching the stage three evolution and regaining armour. In the flagship gamemode, Hunt, either side wins by eliminating the other, the monster can also win by destroying a generator which appears after it reaches its stage three evolution. Rescue mode is essentially capture the flag, where the flags are human survivors and the monster has to kill them. In Nest the hunters are at their most offensive, attempting to destroy the eggs around the map, while the monster is aided by minions (smaller A.I. monsters). Defend is the final mode, it concludes an Evacuation campaign, in Defend; the monster must, with the aid of regular waves of minions, destroy threes generators sequentially. Evacuation is a framework that links five matches together, the winner of each match gains an advantage in the next match, for example; the hunters might win and go into the next match alongside some AI ranchers. It is a neat addition to the multiplayer, but it does little to offset the lack of an actual campaign. The fire effects look awesome. Like pretty much every multiplayer action game, Evolve is at its best when crazy events unfold. In one match the monster wiped my entire team, but Daisy, Maggie’s (a trapper) pet ran off and evaded the monster, long enough for my team to respawn and finish the fight. In another, I was cloaked in pursuit of a Goliath, far ahead of my teammates, I walked around a rock and came face to face with the sneaking monstrosity, just as my stealth ran out. There was a second of stillness before the monster smashed me back perhaps twenty or more meters, into the jaws of a hidden Trapjaw. Unfortunately, this accounts for such a paltry amount of my time with the game, the vast majority was a gruelling crawl. A gruelling crawl punctuated by the occasional bug. I have been kicked from lobbies multiple times, I’ve had the game lock up on the splash screen during account login, and endured seemingly endless match searching times. That said I played on the Xbox One and have encountered the same issues in multiple games, so I don’t necessarily hold all that against the game. I did encounter repeatable lighting issues; shadows not reacting to my characters flashlight, yet parts of the geometry showed up jet black, as if I could somehow see inside the map. Although not a bug, it is irritating to be placed in a match with one or two players where the rest are bots. Similarly, joining a game in progress and not being able to select a character is virtually antithetical to the games’ class driven design. Launching alongside Evolve was a cavalcade of downloadable content, in total worth £48.69 (bundled, more individually) which doesn't include the £19.99 season pass. Most are simply skins for existing characters, which I find difficult to muster much chagrin against. It is worth noting, the season pass which will net you four hunters when they are released, and some skins immediately, but none of the aforementioned £48+ content it included. Let’s not even start on preorder content… Aside from the sheer volume of additional content available at launch, this manner of business isn’t exactly unique to Evolve. The problem I have, is that I don’t believe Evolve has enough content to begin with, nor that the content it does have is consistently good enough to warrant the games’ full price tag £55 (digital, standard edition). Making it extremely difficult to feel good about them selling any additional content at launch, let alone more than the total cost of the game. Evolve has enough decent components to create sensations of cold tension, and moments of explosive action, but they are both fleeting. It all rests upon the player’s ability to find a dependable posse of friends willing to stick out hours of running around fairly mindlessly. The classes are well defined, and the characters therein are varied, but the progression of unlocking them isn’t enough to drive the grind of playing, especially when frequently being placed into in-progress matches with characters you didn’t choose. There are bugs, there are balance issues, there is some sketchy business going on, but the capital crime committed by Evolve, is that it is boring. 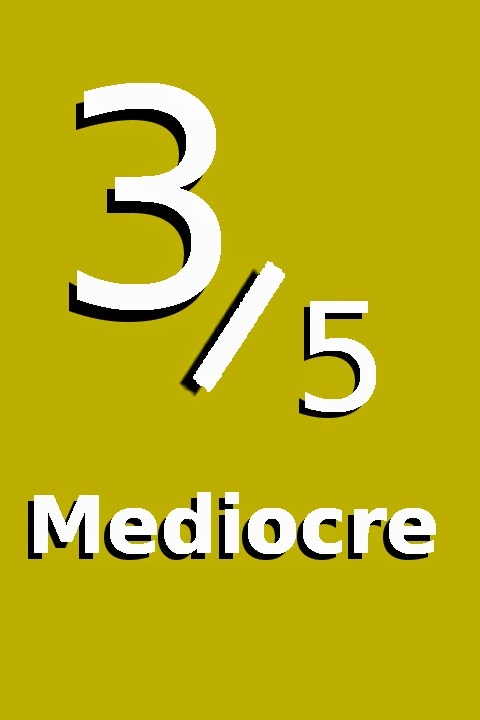 No single element is done all that well, and the pacing is so poor, it left me in a state of dispassion achieved only by the most middling of experiences.